* A Commodore 64/128 (PAL/NTSC). Note that the game is also playable on the GS, but is limited to two-player mode only. Download Not Even Human - Inhumane Edition in .d64 program format HERE! 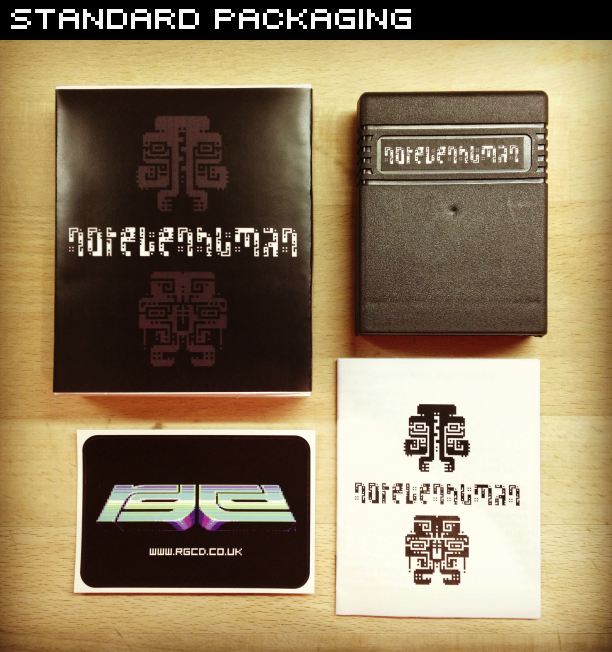 Download Not Even Human - Inhumane Edition in .crt cartridge format HERE! BONUS! Download the original 2008 version of Not Even Human HERE! Back in 1977, the first Voyager probe was launched towards the far reaches of our solar system bearing a golden disc containing information on our species and the location of our homeworld. The disc also doubled up as a vinyl record (the most popular media of the era), holding further information on our civilisation in an audio format; an initial message to any alien race whom was to discover it. In 1985, we received an answer. Data recently retrieved by renowned Astrophysicist Dr. Martin Wendt from his contacts at the NASA archives revealed that the Atlantis intercepted a capsule of unknown origin whilst in orbit around Earth on her maiden flight (STS-51-J). The capsule had no obvious propulsion system and analysis and carbon dating left experts puzzled - the object was less than one year old. It was as if it had been carefully placed, knowing that the shuttle would cross its path. The report states that if the capsule was intended as a reply to our Voyager, then it meant that the respondent had managed to somehow translate our recording without interrupting the mission itself - the onboard computers had not reported any interference since launch. The more disturbing fact that this theory suggests is that the alien civilisation must have been present in our solar system during the initial planetary stages of the Voyager mission, as the probe didn't even begin its interstellar flight until 1990. After much debate, the capsule was opened in 1986 at an unreferenced location back on Earth. 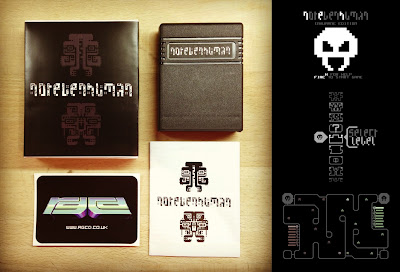 Despite clearly being of alien origin and covered in detailed hieroglyphic-characters, inside scientists found an artifact that was instantly recognisable as a replica of a Commodore 64 data cartridge - a format that was widely used on the most popular computer of the period. The project thereafter became known as "Not Even Human", named after what the main inscription on the cartridge and its container appeared to read. 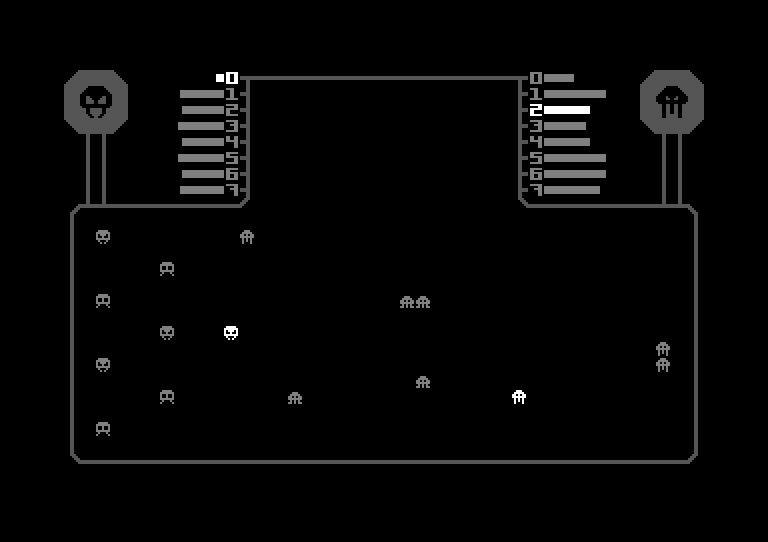 Upon booting the Not Even Human (NEH) cartridge, the technical team noted that the laboratory C64's operating system was replaced by the alien cartridge ROM and it seemed to load some sort of battle simulation. The report shows that the purpose and meaning of this has been argued over for years and even today remains unclear. Are the aliens preparing us for war? Is it a simulation showing how their species functions? Or is it in fact merely a child's toy, highlighting the alien's perception of human civilisation to be in its infancy. Whatever the meaning, one thing was for sure. Not Even Human was fun. In the early 2000's, after no further contact from the alien civilisation, NASA was forced to mothball the NEH project due to increasing government budget cuts. After experiencing the NEH simulation first-hand, Dr. Wendt decided to continue work on the project in his own time, dedicatedly analysing and duplicating the machine code bit by bit from the alien ROM and translating wherever possible. Finally, after releasing his interpretation of the data for other Commodore users to experience in 2008 (much to the US Government's displeasure), it was decided that the program should really be presented to the public in the same format in which it was originally discovered. 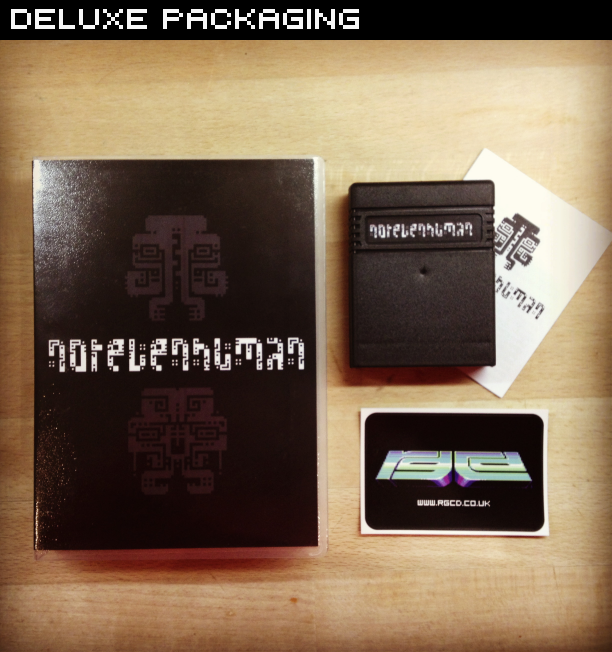 In 2011, after a long legal battle and many failed US Government attempts to 'silence' the project, RGCD and Onslaught are proud to present the official cartridge version of Not Even Human (Inhumane Edition). To play the game (downloaded from the links above) you will need either a real C64 (and a method of transferring the files over to it) or an emulator. For emulator users, we recommend VICE, as it works on a variety of systems and is very user friendly. Just download the emulator and drag and drop the .prg file into the open program window (or attach the .crt image from the file menu). Note that pressing the Spacebar will bypass the intro sequence. NEH is a two player, real-time strategic battle simulation. 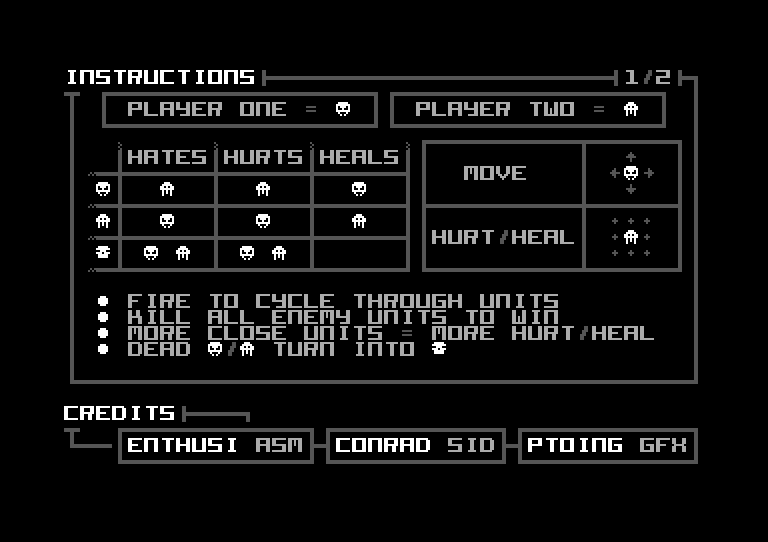 Each player controls a number of units and the aim is to kill your opponent. The rules are simple. If two of the same unit types are grouped together, their energy increases. If two different unit types are grouped together, their energy decreases. When dead, a unit transforms into a deadly skull (that eventually fades away). Contact with any unit and a skull results in energy decrease. Using the joysticks to move and fire to cycle through units, you'll need to surround your enemy with multiple units to ensure their energy depletes faster than yours. It's simple to learn, but takes time to master. When there are only three units left, a siren will sound and the remaining units will start to lose energy. The last player left alive will be declared the winner. 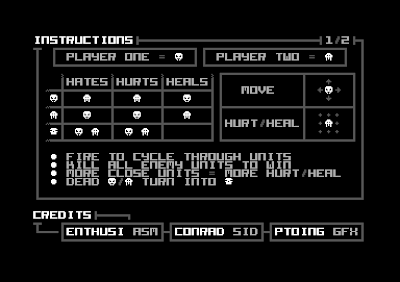 Press the 'H' key at the title screen for a simple breakdown of game rules and key commands. Joystick (Port 1) movement – move current player one unit. 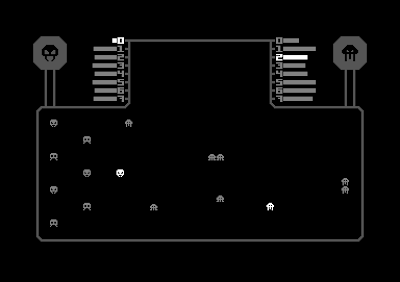 Joystick (Port 1) fire – cycle through player one units. Joystick (Port 2) movement – move current player two unit. 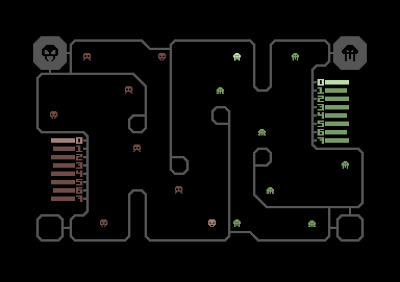 Joystick (Port 2) fire – cycle through player two units. H (from title screen) - view instructions. F1/F2 – Cycle forwards/backwards through colour schemes. 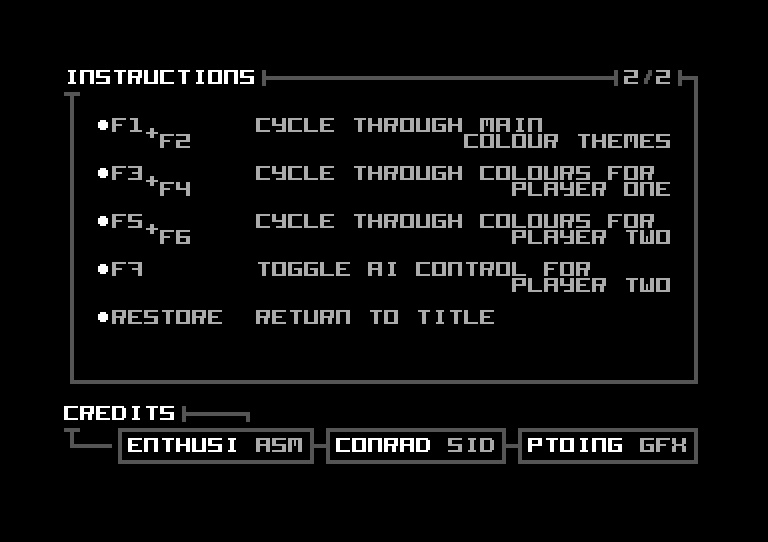 F3/F4 – Cycle forwards/backwards through colours (player one). 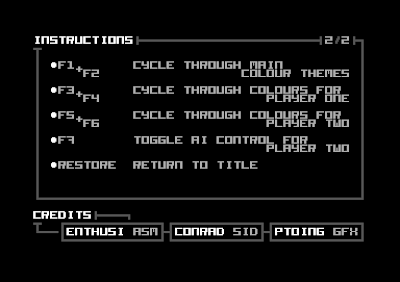 F5/F6 – Cycle forwards/backwards through colours (player two). 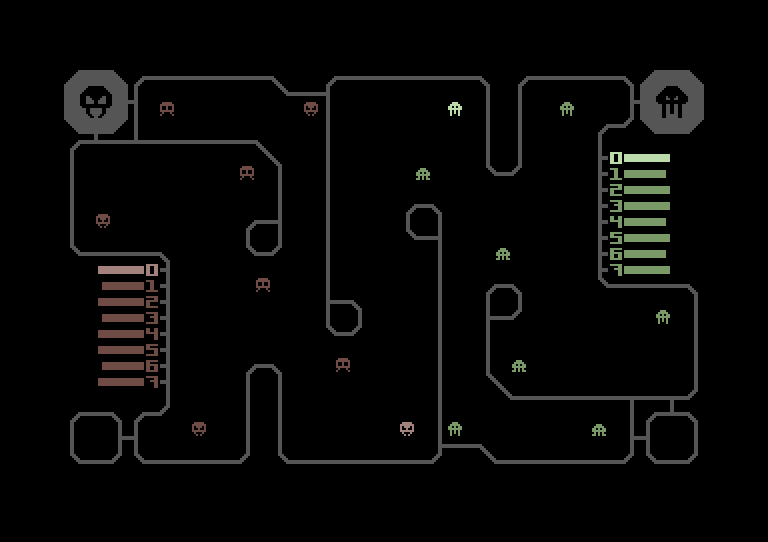 F7 – Toggle AI on/off for player two (practice mode). 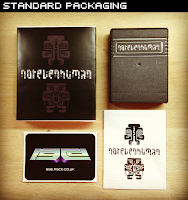 Not Even Human - Inhumane Edition has been tested on both PAL and NTSC machines, and works on the C64, C128 and C64GS (there is no keyboard input required to play). Although it runs on NTSC hardware, it does play fractionally faster as a direct result of this. As such, the game is labelled as NTSC compatible, but designed for PAL systems. SID 8580 recommended. Below is a short promotional video recorded using the VICE emulator showing the game being played in two-player mode. Not Even Human - Inhumane Edition is an Onslaught/RGCD production, Copyright 2009-11, published on cartridge by RGCD 2011. 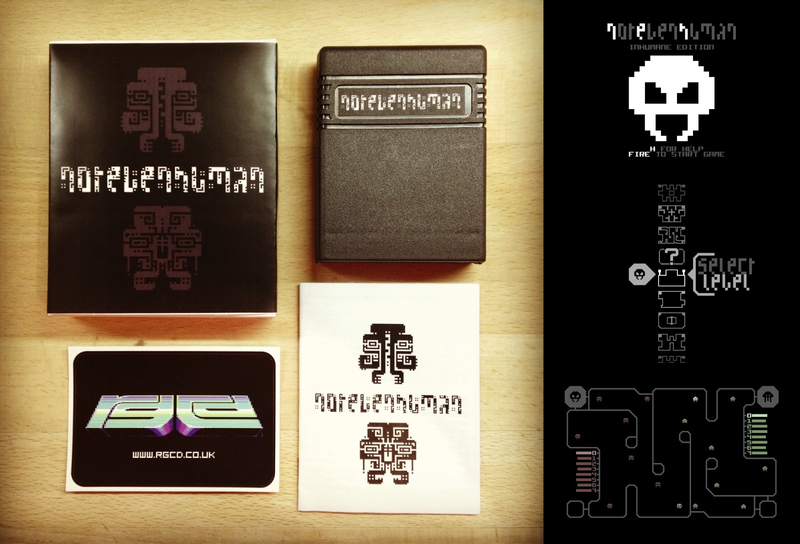 The cartridge version of Not Even Human - Inhumane Edition is available to buy from our shop. 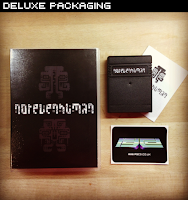 The game is presented in a classic black cartridge shell complete with a printed manual and a vinyl RGCD sticker.